Natural Planters made from Natural Materials - Design Led Planters Ora Home Ltd. 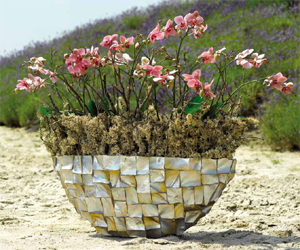 These planters, made with genuine mother-of-pearl, are a guaranteed eye-catcher in any space. The continuously shifting colour nuances hypnotise from every angle, capturing the sparkle of the sea and light of the sun in a spectacular fashion. Enjoy the beauty of a mysterious underwater world that adds something truly unique to any interior. All three colour variations â€“ black mother-of-pearl, cream mother-of-pearl and pink mother-of-pearl â€“ are made of 100% genuine shells. These shells originate from special shellfish breeders, meaning that the harvesting of the shells has no negative impact on marine life and is fully sustainable. This protected environment also guarantees perfect quality shells. Purely handmade and exceedingly labour intensive, the production of a single tall Radica planter requires around two hundred man-hours! The reason for this is that every single shell is cleaned, ground, adhered, polished and varnished. Like a detailed puzzle, skilful hands create a unique mosaic for every piece. The smaller bowls also have a lovely decorative inside, making them a stunning eye-catcher with or without greenery. 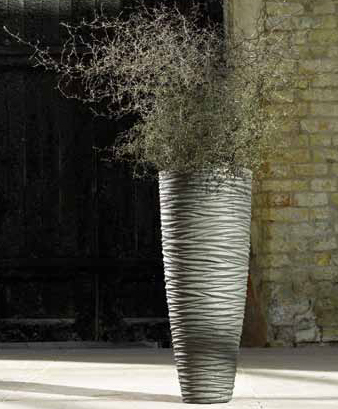 These planters never fail to surprise, with their rugged natural appearance and extremely light weight. In other words, they are the ideal planter for those looking for practical beauty. Their simplicity also draws attention to plants that might not otherwise be noticed. The secret of Polystone and Carrara lies in ground stone. The Carrara is made of a marble-like powder, while Polystone is made of granules varying from fine to coarse (Polystone Rock). Combined with synthetic resin, the stone granules form a strong viscous substance. This material is then pressed into moulds by hand using an old traditional method. 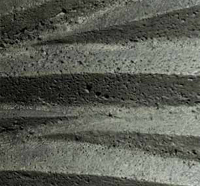 The relief on the inside of the mould determines the ultimate pattern on the planter. The planters then harden at room temperature. This slow process is reflected in the attractive surface. The Polystone and Carrara collections are designed for indoor use, but Polystone is equally at home outdoors under a covering or during the summer. 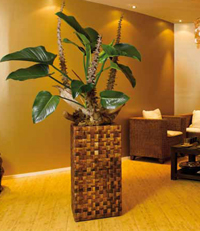 These beautifully woven planters from the Banana collection look as if they were made of inlaid wood. Together with the twisted fibre models, these planters are without doubt the â€˜gentlestâ€™ of all the planters. They are 100% natural, as the body that is also made of sustainable wood. They are the perfect addition to interiors with a green and natural style, yet equally as fitting as a contrast in environments dominated by hard materials or cool colours. The unique raw material used to produce this series is the abaca stem. These stems are around two metres in length and are peeled lengthwise. The closer to the heart of the stem, the narrower the sheath, whereas the outermost layers have a width of up to twenty centimetres. Once the leaf sheaths have been cut to size, they are soaked in a dye bath. This gives them a beautifully rich hue and colours them completely through. During the natural drying process, the material takes on a sunny shine that, when combined with attractive greenery, is sure to catch all eyes. The Banana series features square and round planters of various heights and sizes. There are two styles from which to choose. The square planters are woven, giving them a lively, animated look, while the round models are made of fibres that have been twisted to create rope, which is then wrapped around the body of the planter. The result is a textile look, similar to carpet or matting. The inside of both models is partly coated for added protection and style. We have over 20 products in our Natural Planters range.